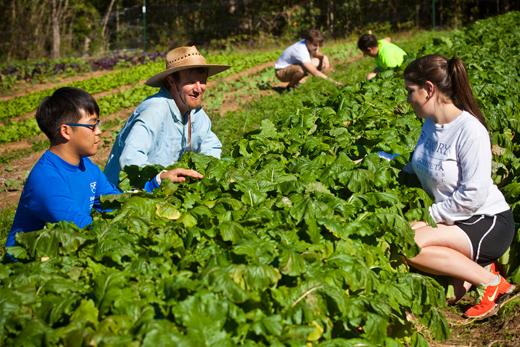 The organic farm at Emory's Oxford College only opened in 2014, but has already been selected as one of the best college-run farms in the country. The Oxford College Organic Farm has been named one of the Top 30 Sustainable College-Run Farms, a ranking recently released by College Values Online (CVO), which considered a total pool of 100 farms. Calling college farms "no longer just research sites, but…centers of student solidarity and community nutrition," CVO ranked each farm based on qualities such as total size, organic certification, sales to campus dining halls, Community Supported Agriculture (CSA) offerings, academic courses, and sales to off-campus venues. Oxford was ranked 17th out of the 30 colleges selected. "It has always been our goal that the farm bring together sustainability, education and positive impact on the local community," says Stephen Bowen, dean of Oxford College. "It is gratifying to have our efforts recognized nationally." The organic farm began operation in 2014 on land donated by Trulock Dickson 72OX 74C, who bought it from Marshall and Fran Elizer, beloved figures at Oxford College who served for many years as administrator and library assistant, respectively. The scale of the property at just over 11 acres and the location, 700 feet from Oxford's campus, were ideal for a college farm. The operation is led by organic farmer/educator Daniel Parson, who was selected for the role in 2013, following a national search. Parson brought 15 years of experience in organic farming. He earned both a bachelor's degree in biological sciences and a master's degree in plant and environmental science from Clemson University. His prior recognition includes both the Georgia Organics Land Steward of the Year Award and inclusion on the Mother Nature Network's 40 Farmers Under 40 list. Parson credits the Oxford farm's quick success to all of those who made its existence possible. "It is really the groundwork laid for years before we started plowing that has made all the difference," he says. "Many people deserve credit for creating such a special place at Oxford/Emory." Parson is seen each Tuesday at the Emory Farmers Market, and students at Oxford regularly dine on produce from the farm in the college dining hall. The CSA has participants from the college and surrounding Newton County community, who rapidly fill each subscription sign-up. The farm has been smoothly incorporated into Oxford's curriculum, and not just in biology and environmental science. Courses in philosophy, economics and sociology also make use of lessons provided by the farm. Including the dozen or so students who are assigned there through work/study, nearly 150 students spend at least some time on the farm each week. Ciannat Howett, Emory director of sustainability initiatives, notes that the newness of Oxford's farm gives its Top 30 ranking additional impact. "To have only opened in 2014 and already achieved this ranking is remarkable," she says. "Because criteria for the ranking relate to selling to campus dining halls and other outlets such as the farmer's market, it is also a testament to [Emory senior director of dining] David Furhman and the Emory Dining team's supportive leadership and vision." The complete list of 30 farms selected can be seen on College Value Online.